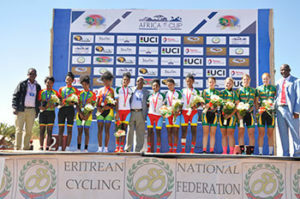 Eritrea’s Men & Women National Cycling Teams won Team Time Trial (TTT) Gold Medals respectively in the 1st stage of Africa Cycling Cup 2018 that rolled off today. According to report, Team Ethiopia and South Africa are forced to settle Silver and Bronze medals respectively in the women’s TTT whereas Rwanda and Ethiopia finished second and third in the men’s category. Individual Time Trial (ITT) of the Africa Cycling Cup 2018 will be conducted tomorrow 22 November.